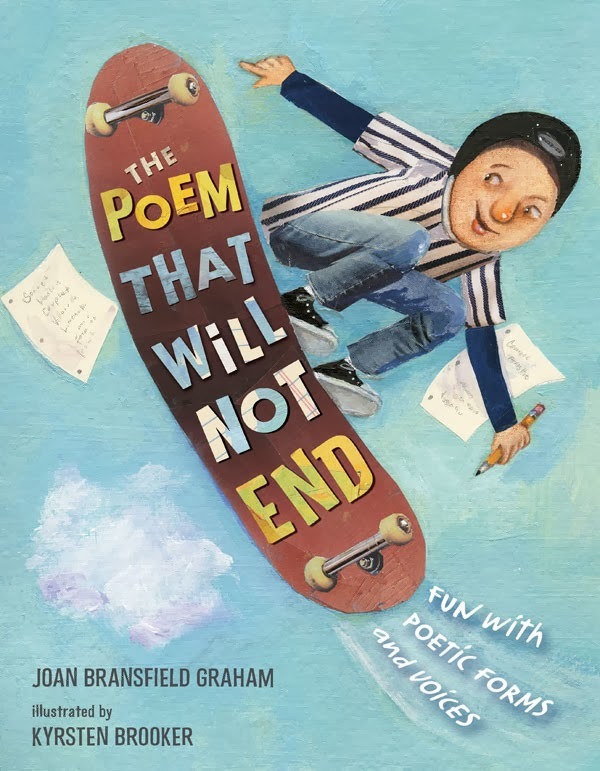 I'm so excited to host the first day of the Blog Tour for poet Joan Bransfield Graham. Her new book, The Poem That WIll Not End is due out tomorrow. 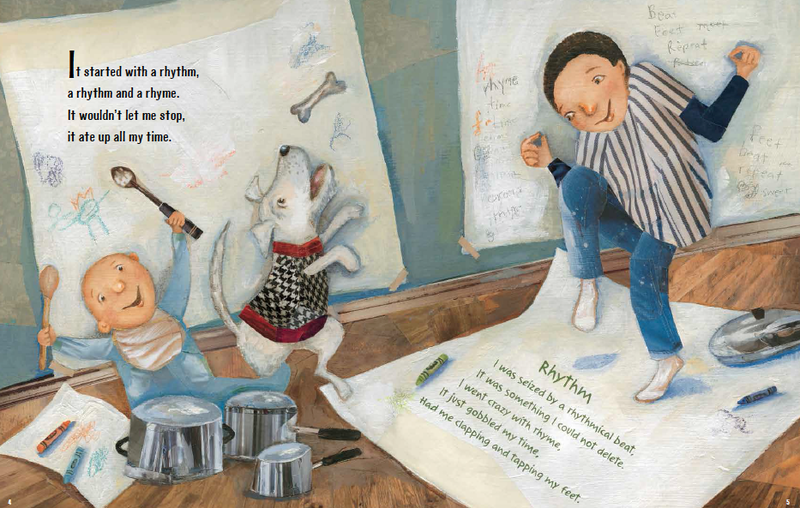 It's an ingenious picture book that is half story and half poetry notebook, all told through the point of view of a rambunctious young boy. Here, Joan shares a bit of the "back story" behind the creation of this book. 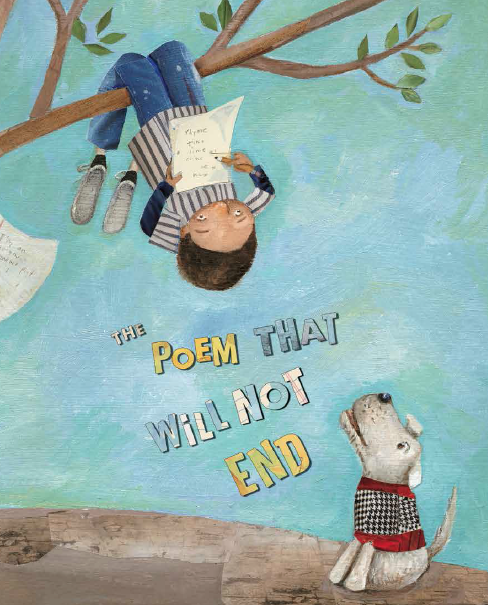 I am thrilled that Sylvia agreed to be a part of the Blog Tour for my new book THE POEM THAT WILL NOT END: Fun with Poetic Forms and Voices, which debuts tomorrow, Jan. 28, from Amazon Children’s Publishing/Two Lions. 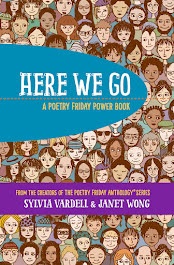 Sylvia has done so much to connect people through the pleasures of poetry! 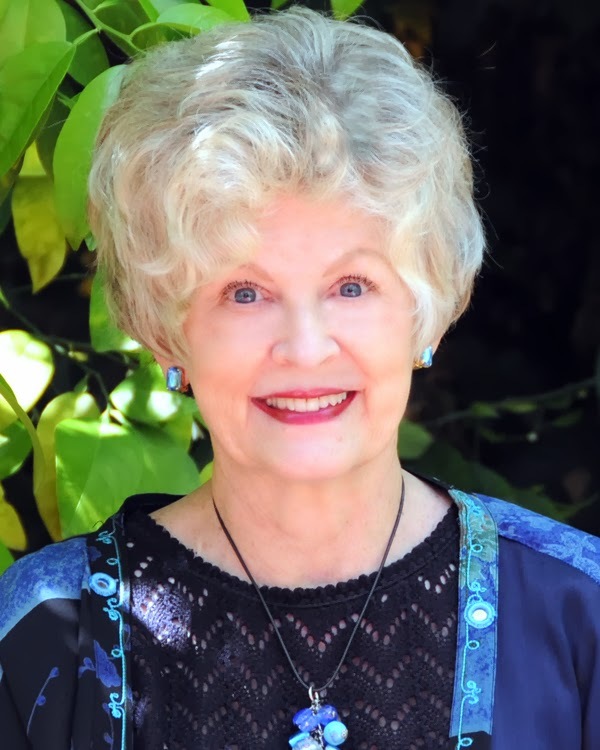 Traveling worldwide to speak, teaching her University classes, and editing her own poetry anthologies, it astonishes me how she can fit it all in. “It started with a rhythm, / a rhythm and a rhyme.” And, just like my main character, Ryan O’Brian, I couldn’t stop myself. This book is the opposite of Writer’s Block. Ryan is on a creativity streak with no end in sight—he can’t STOP writing poetry and does so in many inventive ways. There is a story poem, 22 poems embedded in the artwork, and a three-page glossary of 15 poetic forms and five voices done as Ryan’s “notebook,” complete with doodles. The information was broken up visually and done in such an entertaining way. Thanks, Art Director Katrina Damkoehler and Designer Ryan (!) Michaels. The illustrator, Kyrsten Brooker, who lives in Alberta, Canada did a fabulous job! I love her energy, her perspectives, the textures of her stunning collage and paint technique. On page 13, where Ryan is stuffed into a basketball net, she said that, as crazy as that might seem, both of her sons had done that! She decided to do the back matter as Ryan’s notebook. 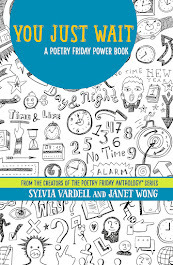 When I had too many poems to fit in the book, my fantastic editor, Melanie Kroupa, suggested putting one on the back cover and had many fun thoughts about the art. When I noticed all the words in the title were about the same length, it struck me perhaps we could “skateboard” the title. My manuscript for THE POEM THAT WILL NOT END won First Prize in the Picture Book category at the SCBWI Orange County Retreat 2010. In January 2011 I met my wonderful editor, Melanie Kroupa, at our SCBWI CenCal Retreat at the Santa Barbara Mission. Melanie was amazing to work with and included me in the conversation throughout, encouraging my ideas. At a later workshop, I discovered that the four anchor standards of the Common Core are Communication, Collaboration, Critical Thinking, and Creativity. All of those come into play in the creation of a children’s book, don’t they? 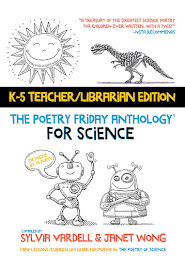 There are Teacher Idea Sheets and a Common Core Guide available for my book. 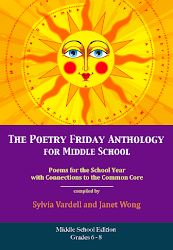 In March I am planning to offer a contest for students to suggest a creative stanza of their own inspired by POEM. We’ll try to “go around the world” so that the poetry will not end. There will be prizes—books, of course—with a Grand Prize of a free one-hour Skype Author Visit plus two 30-minute Skype prizes, too. I’ll be sure that Sylvia gets all the details to pass along. If there were a collective noun for a “gathering of poets,” I think it would have to be a “passion of poets” since poets are so passionate about their work. I was fortunate to have the opportunity to study with Myra Cohn Livingston in her UCLA Poetry Master Class. What an insightful group that was and is; many of their names are listed here on your blog. 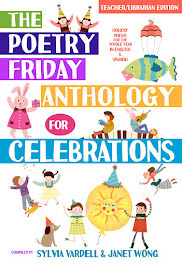 I also feel honored to be included with them in many of Lee Bennett Hopkins’, Paul Janeczko’s, J. Patrick Lewis’, and yours and Janet Wong’s extraordinary anthologies. And Marilyn Singer’s ALA “Poetry Blast” soirees are legendary—truly a passion of poets. I had Amadeus in my mind as I was writing, remembering his artistic fervor. And so I dedicate THE POEM THAT WILL NOT END to all artists, writers, actors, musicians who have a “Fever” (p. 22) to paint, write, perform, play music—who throw themselves completely into their work, which in the end might be exhausting but . . . joyful. Ryan writes a haiku (p. 8) on his friend’s white shirt: Smooth patch of white snow/ stretched out before watchful eyes--/ an invitation! Dear Creative Friends, may every blank sheet of white paper offer a pristine patch of freshly fallen snow, just waiting for your unique footprints. 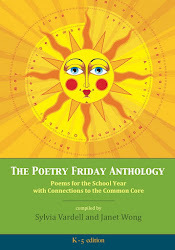 Note: The publisher will provide a Teacher's Guide for this book with ties to the Common Core. I'll post the link as soon as I get that information. 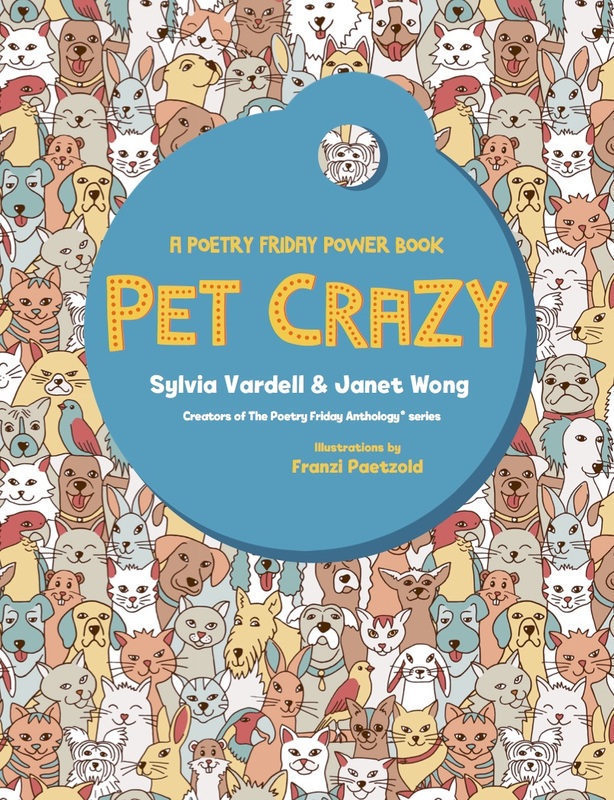 Monday, Jan. 27--Poetry for Children--Dr. Sylvia Vardell, Texas Woman's University, Denton, TX, a behind-the-scenes look, ABOVE! 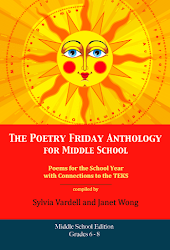 Wednesday, Jan. 29--Double Olympic Poetry Challenge--an international event! Lots of fun learning the backstory of this book! Honored to be included in the blog tour. Can't wait to read all the posts this week. Congratulations, Joan, and thank you, Sylvia! Brava Joan! 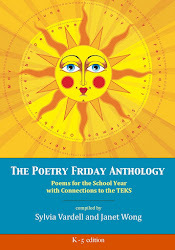 Thanks for providing the world with another great poetry book. Sylvia, thanks for kicking things off! Jama, so glad you stopped by--I look forward to celebrating with you on Friday at Jama's Alphabet Soup! Charlie, thanks for your kind words. Dear Sylvia--thanks for kicking off the tour! Dear Joan--you're so incredibly thorough, as usual--we can't wait to invite our own readers to play with your exercise on Wednesday. Thanks so much for including us in your tour! So looking forward to reading this book! Joan's work is awesome! I'm headed over to Amazon to order a copy right now! 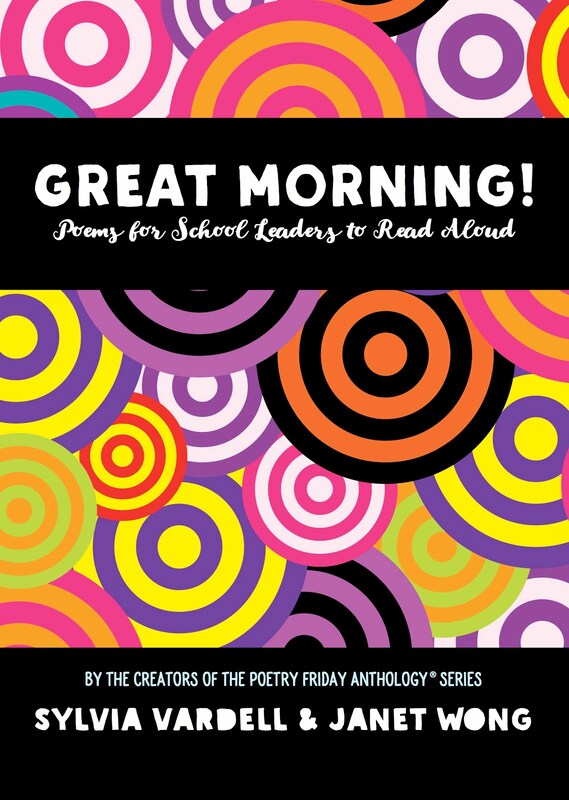 I can't wait to read and share it with my students! 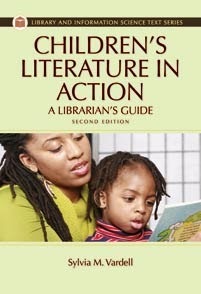 This looks like a wonderful book. Thanks for the heads up. I love the idea of a group of poets being called "a passion of poets"--how poetic (and appropriate)! Congratulations on this gorgeous and fun book. Prediction: BESTSELLER! I love "a passion of poets", too. It's perfect. I learned about your book on Jama's blog today. The post was so delightful that I'm taking the whole blog tour!